The famous Dutch author Frans Kellendonk (1951-1990) was in the process of writing a new novel in the nineteen eightees. The story was inspired by the probably racist murder of Kerwin Duinmeijer (1983) and the play Leeuwendalers (1647) by the Dutch author Joost van den Vondel (1587-1679), and remained unfinished. Kellendonk wanted to use a Creole language in his novel and during his visit of Curacao in 1987 he got to know Virgin Islands Dutch Creole. He copied Hesseling (1905) and De Josselin de Jong (1924), but also several pages from Magens (1818). These photo copies and a manuscript in which some words and small sentences are noted by Kellendonk, are stored in the so called Archief Frans Kellendonk in the Library of the Maatschappij der Nederlandse Letterkunde in the University Library of Leyden. My article about these notes is published in Nieuw Letterkundig Magazijn, XXXV, 1, mei, 2017, pp. 30-36. 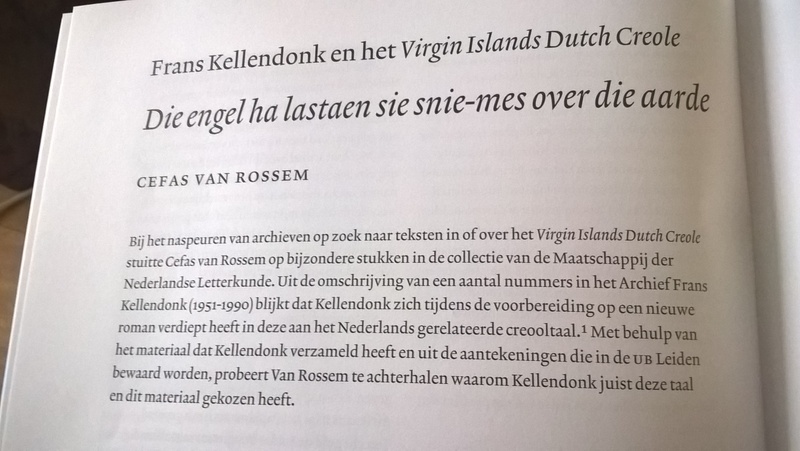 In the same volume Jan Noordegraaf published an article about D.C. Hesseling and his work on Papiamentu: ‘D.C. Hesseling en de West, van classicus tot creolist’. In: Nieuw Letterkundig Magazijn, XXXV, 1, mei, 2017, pp. 25-29. This entry was posted in Announcements and reviews, Manuscripts. Bookmark the permalink.